The results are so far from reality because using intelligence instead of ability is also far from reality. A capitalist society rewards a person’s ability to provide a better good or service to other people at a lower price, and there’re other abilities that allow a person to capitalize on that. IQ has little to do with these. Not saying it’s good or bad, or even fair or unfair. “IQ has little to do with these.”… so we agree! The conclusion is reached based on a particular assumption: nothing new in Statistics and Science in general. The key point is normality assumption, which is clearly unrealistic. There are tones of evidence showing that abilities follow skewed distribution (log-normal, power law, etc.). And not only inteligence, think about the distribution of ability in any sport: you cannot realistically model time for running 100 metres as a normal distribution. BTW, there are many natural phenomena that are better fit as power laws or the like, not as normal distribution. But focusing on intelligence/abilities and economic outcomes, there is strong evidence of the estimated parameters of the power law distribution of income and/or wealth being stable if not constant for many different current and historical economies from Semifeudal Prussia or capitalist Italian cities to communist-like regime of the Jesuits in Peru under Spanish rule (see Kleiber, Christian and Kotz, Samuel (2003), Statistical Size Distributions in Economics and Actuarial Sciences, Wiley, and Gabaix, X. (2009), “Power Laws in Economics and Finance”, Annual Review of Economics 1:255–93). We can discuss to what extent the (power law) distribution of abilities translates into the (power law) distribution of income/wealth. For sure there is no one-to-one relation, but any argument based on normality assumption is faulty from first principles. Actually, some authors have already shown that the very very very very top observations in income/wealth distribution are abnormally large even for a **power law** distribution, suggesting some type of market power for those particular observation. But even if the conclusions are “similar” or have some agreements, it should be important when making statements from an empirically, data-based, scientific perspective to use proper and logically correct procedure. What is your source that you cannot model running times as a normal distribution? A quick google search brings this up: https://www.quora.com/Does-running-swimming-speed-follow-normal-distribution-in-statistics – which seems to make a lot of sense because there a lame people and there are fast people within some very well defined limits and most people are just average… but nobody is able to e.g. run a marathon in, let’s say, a few minutes (which would be the case if you had a distribution there like the wealth distribution)! Perhaps you made the mistake of just looking at sports statistics of professional athletes but this is not a representative sample of the whole population. My sources are the SCIENTIFIC references (not casual observations found in google) that I mentioned in my first comment. Perhaps you made the mistake of just not reading them… and also not noting several other examples of whole population representativeness. Furthermore your reply is obviously incorrect, showing you lack of understanding of distributions: no one will run a marathon in a few minutes, but will do it in many hours giving you a tail as in the income/wealth. Your one and only example is missing both people running fast AND these person running so slow that the do not participate in the marathon… Please, be serious or just stop blogging. Please be polite or just stop commenting. Will have a look at your references in due time. To your point concerning the tail of the distribution: we are talking about the most positive end, right? The most intelligent, the wealthiest… and the fastest, i.e. the winners. If we had comparable distributions concerning the winner’s side the winner of the marathon would win by such a huge margin as Jeff Bezos wins his race. Makes sense? …plus: the only sources I see are for the economy and finance! What are your scientific sources for your statement “you cannot realistically model time for running 100 metres as a normal distribution.”? An IQ score is defined to be a normal, so you are comparing things that don’t make sense to be compared. 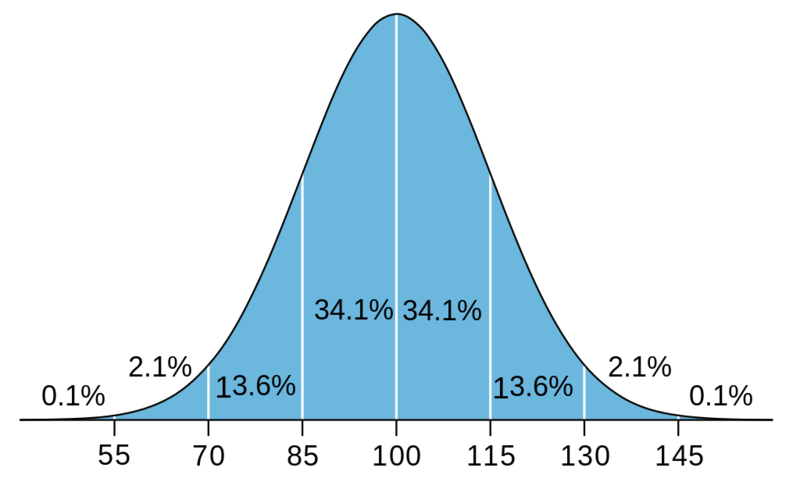 Simplifying a bit, an IQ score comes about by assigning a rank percentile to the corresponding percentile in a normal distribution. For example, say you had a phenomenally wide-ranging IQ test administered to people. Rank the people by the number of questions they get correct. Say that the median number of questions answered correctly was 100. The next, say 10% of people might get 200 questions correct. The next 10% might get 1000 more questions correct, and so on. You could have complete non-linearity in the results and the IQ curve would dutifully return a normal distribution with a standard deviation of 15. To do a fair comparison, you could do this exact same process and create a wealth quotient (call it a WQ score). Defining the median to be a WQ score of 100 +/- 15. The end result would be that Bezos has a WQ of 196.1035. Compare IQ with WQ, or compare ability (good luck!) 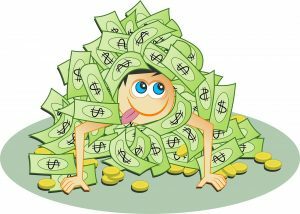 with wealth (easier), but don’t compare IQ with wealth. Mussen, Paul Henry (1973). Psychology: An Introduction. Lexington (MA): Heath. p. 363. ISBN 978-0-669-61382-7. The I.Q. is essentially a rank; there are no true “units” of intellectual ability. Truch, Steve (1993). The WISC-III Companion: A Guide to Interpretation and Educational Intervention. Austin (TX): Pro-Ed. p. 35. ISBN 978-0-89079-585-9. An IQ score is not an equal-interval score, as is evident in Table A.4 in the WISC-III manual. Bartholomew, David J. (2004). Measuring Intelligence: Facts and Fallacies. Cambridge: Cambridge University Press. p. 50. ISBN 978-0-521-54478-8. Lay summary (27 July 2010). When we come to quantities like IQ or g, as we are presently able to measure them, we shall see later that we have an even lower level of measurement—an ordinal level. This means that the numbers we assign to individuals can only be used to rank them—the number tells us where the individual comes in the rank order and nothing else. I don’t know how to format the above text to be proper quotes, but they each make valuable points. Especially the last one talking about how since IQ is an ordinal/rank metric, a 10 point difference means the same thing as you move around the scale. > Yet I would think that the relationship between IQ and “real mental ability” is much more linear than between your WQ and wealth. I don’t know about studies, but consider an idea like: a person w/ an IQ of 120 will reach a conclusion in X time, and a person w/ an IQ of 100 will take 2X to reach the same conclusion. That kind of statement assumes that mental accomplishments are something like walking/running a distance. That some people might be faster, but nothing is keeping a person who can walk at least some, from reaching the same distances as the world’s best runner, except time. I’m not sure that interesting mental abilities are like that. As I think about, say Einstein’s contributions to physics, I struggle to think whether I would have ever come up General Relativity. Was he actually doing things on a level I could never attain? It really seems like it. Or take a more modern example with say Jeff Dean and Sanjay Ghemawat at Google. This is a nice article about them: https://www.newyorker.com/magazine/2018/12/10/the-friendship-that-made-google-huge. Same idea, their solutions to problems are things that I could easily believe that I would never come up with. So perhaps there are mental abilities that allow some to reach a cliff high above the heads of most mortals. Does this mean that mental abilities are linear? I’m sure some are (reading speed or something feels like one of these), but I can easily imagine abilities that differ by kind, and not by degree. There are many aspects in your comment that are certainly true. Obviously there are huge problems in measuring “true” mental abilities, which is the exact reason why people came up with a somewhat artificial “intelligence quotient” with all its shortcomings. What would be interesting to see is (and I don’t know if you perhaps have a source about this) what the outcome of an intelligence test would look like without the “quotient” part, i.e. without subsequently normalizing the results. I guess the relationship wouldn’t be strictly linear but it wouldn’t be as extreme as the wealth distribution either. What I think is true in any case, independent of the distributions, is when you rank all people by intelligence and by wealth respectively you wouldn’t really see any stable connection – and that spirit was the intention of my post in the first place and I still stand by it, although some of the technicalities are obviously debatable.